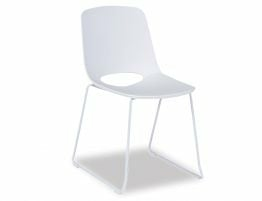 Exceptional design can be yours with the Wasowsky white mod dining chair from notable design team Enrique DelAmo and Angel Marti for OOland. 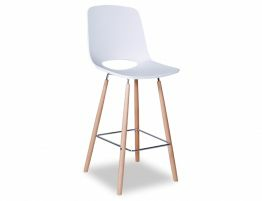 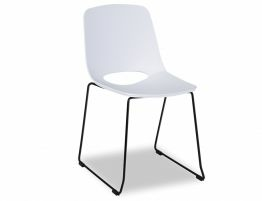 This all white dining chairhas a soft molded polymer seat and back that follow the body’s form and steel post legs in a factory white powder coat paint that is ultra durable. 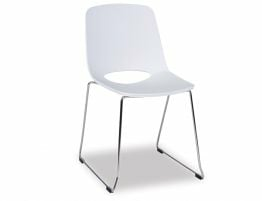 Whether you are in search of white plastic kitchen chairs for your refined, modern kitchen or commercial dining chairs for your café, this contemporary white café chair offers a fresh, clean look and upscale casual design for your spaces. 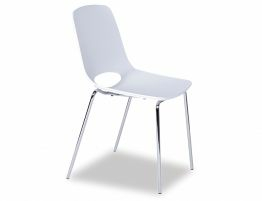 The Wasowsky range of dining chairs includes a number of colour and base styles from which to choose YOUR favorite. 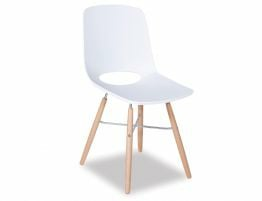 Customise the look of your space with on-trend modern furniture pieces from highly sought after designers from studios like OOLand.